Matt Sharp likes to mix things up. 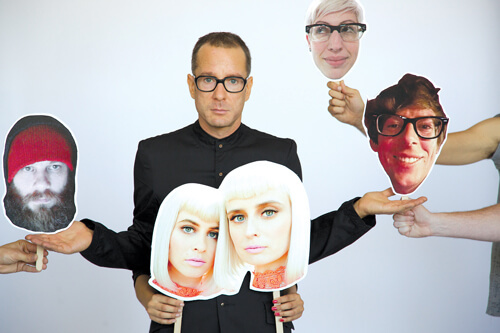 The frontman and chief songwriter behind synth rock act The Rentals has been inventing and reinventing their sound since he formed the band as a side project to his then main gig in Weezer way back in 1995. The Rentals enjoyed a hit right out of the gate with a slice of MTV-fueled candy called “Friends of P” off their debut album, Return of the Rentals (Maverick/Reprise, 1995). But the demands of juggling two hit factories at once — Weezer and The Rentals — eventually forced Sharp to commit to only one project shortly after Weezer’s Pinkerton album was released in the fall of 1996. Sharp left Weezer to concentrate on The Rentals’ sophomore album Seven More Minutes, released on Maverick/Reprise in 1999. The record failed to produce a hit as big as “Friends of P,” and Sharp put The Rentals on ice for a few years to focus on solo work before revising The Rentals in 2005 with a different line-up. More recordings — and an elaborate audio-visual art project — followed, and then The Rentals kind of disappeared again, only to return late last year with Sharp fronting yet another lineup for the release of Lost in Alphaville (Polyvinyl, 2014), an album that continued to capture that classic Rentals sound characterized by vintage synths, a pillow of female-voiced “oh’s” and “ah’s,” and Sharp’s own flat, deadpan vocals. Despite the sonic consistency, Sharp said changing up musicians in the band has kept the project fresh. For Lost in Alphaville, the female vocals were handled by Jess Wolfe and Holly Laessig of the band Lucius. “A lot of what drove this latest record was working with Jess and Holly in a very similar way,” Sharp said. Rounding out this version of The Rentals is Shawn Glassford of Starfucker on bass and synths, Ryen Slegr of Ozma and Ted Gowans of Tegan and Sara on guitars, and Jared Shavelson on drums. King and Ellison also will play synths, with King handling violin. The songs on Lost in Alphaville have the same hooky appeal as anything off their hit debut, but that doesn’t mean the record will produce a hit as big as “Friends of P,” which peaked at No. 7 on the Billboard Modern Rock Chart. Certainly Sharp is swinging for the fences as he did back in ’95, bringing in veteran producer Dave Sardy (Rolling Stones, Jay Z, Tegan and Sara) to handle mixing chores. Today, with countless channels and outlets for media, is it possible for The Rentals to enjoy the kind of success that Weezer had? The Rentals play with Rey Pila and Radiation City, May 15, at The Waiting Room, 6212 Maple St. Showtime is 9 p.m. Admission is $15 Adv., $18 DOS. For more information, visit onepercentproductions.com.